Art has always been meaningful and symbolic even when depicted with a collection of objects on a flat picture plane, which lacks visual accuracy. The issue of manipulating a flat surface to create the illusion of three dimensions was addressed in Europe during the Renaissance, when some artists conducted careful observations of nature and even anatomical dissections to try to better understand the world around them. But it wasn't until the early 15th Century that the Florentine architect and engineer, Lippo Brunelleschi, developed a mathematical theory of perspective. In a series of optical experiments he analysed and experimented with visual lines of sight emanating from points of perception. In this way Brunelleschi was able to understand the science behind perspective, the visual system that attempts to represent three-dimensional space on a flat surface. Perspective works because it is a visual "illusion". It depends on the way our eyes see something and the way our brains organize that virtual space, adopting perspective to give the illusion of depth. Brunelleschi's discovery was applied for three centuries as the norm of European art to picture the human imagination. The aim for the most part was to imitate tangible visual reality. Art is distinctively a product of the faculty of the mind, which perceives the image of one thing in the form of another. Each person has the ability to think in two ways - judicially and creatively. The judicial function of the mind is to provide and analyse facts, to pass judgment on any incoming data about reality through the senses. In contrast, the creative aspect of the mind deals with the unknown, within the arena of possibility. In this connection, an artist demands a parallel fact or fancy, of which the first furnishes a suggestion. Human imagination has that extra power that allows us to peer beyond the ordinarily material world and explore deep into the abstract worlds of mathematics, science, metaphysics, etc. In art, from the middle of the 19th century it was colour which began to carry the imagination into the making of images. A key influence on this process was Goethe's book , 'Theory of Colours' published in 1810, from which the following two quotations show the ideas that artists began to respond to..
"When the eye sees a colour it is immediately excited and it is its nature, spontaneously and of necessity, at once to produce another, which with the original colour, comprehends the whole chromatic scale". "The chromatic circle... [is] arranged in a general way according to the natural order... for the colours diametrically opposed to each other in this diagram are those which reciprocally evoke each other in the eye. Thus, yellow demands violet; orange, blue; red, green; and vice versa: thus... all intermediate gradations reciprocally evoke each other; the simpler colour demanding the compound, and vice versa". Goethe's writings on colour, although not scientific, were assimilated by one of his contemporaries, JMW Turner, who was also immersed in theosophy. Theosophy is the name used for any system of philosophy which starts from a supposed knowledge of God, and proceeds to formulate laws of the universe on the basis of revelation or of direct knowledge. Usually the claim of a supernatural revelation is made, though this is not essential, and usually, also, theosophy is mystical, holding that systems of truth are revealed through states of mystic feeling. Turner together with Anton Mesmer, the hypnotist and healer, the astronomer William Herschel, the Swedish mystic Emmanuel Swedenborg, and the German idealist philosopher George Hegel, adopted and nurtured a world view which accepted the notion that the cosmos shapes human destiny. According to art historian Charlotte Douglas, the shift to abstract art in the early 20th century was prompted by a need for new dimensions of consciousness using forms suited "to serve as a passport to and report from" the so-called higher spiritual realms. 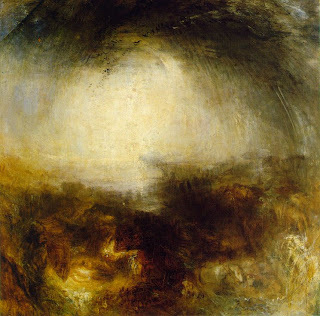 As an early participant in this approach to creativity, Turner was a master of capturing the intangible in paint, increasingly pushing his subjects to the point of vaporisation.... the physicality of a snowstorm, where liquid becomes unyielding, sky becomes sea. His painting doesn't necessarily have to reproduce real life in specific detail. In this respect, Turner invented a way of using colour to provide atmospheric depth to the surface of his pictures- "land becomes sky. He revelled in those situations, where recognisable detail was only achieved by a fleeting intensity of focus, as if it were an apparition." Cornelia Parker (Tate online). Goethe's 'Theory of Colours' contains some of the earliest published descriptions of visual phenomena such as coloured shadows, refraction, and chromatic aberration. Turner studied the book comprehensively, and referenced it in the titles of several paintings, one of which, Shade and Darkness- the Evening of the Deluge, painted in 1843, is just about as abstract a landscape as would be produced today. In traditional European art, both form and colour are "right" or representational. The artist starts with form and the form determines the colour. Colour follows form; the artist cannot start with colour. The traditional artist cannot use colour alone as a means of expression. In the early 20th century, art underwent momentous changes from this old norm. Artists became increasingly interested in non-naturalistic representation, departing from the traditional use of form and colour. From 1904, the Fauve artists, including Henri Matisse (1869-1954), André Derain (1880-1954), Raoul Dufy (1877-1953), Henri Manguin (1874-1949), Maurice Vlaminck (1876-1958) and Georges Braque (1882-1963), began to portray familiar objects with "unfamiliar" colours. It was the use of colour as a starting point for creativity and a narrative thread of the imagination that produced the second revolution of European art. Perspective gave way to colour! 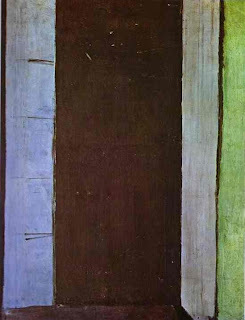 Matisse in particular liberated colour so that it is was no longer determined by form. His colour looks for a sensation that represents his subjective imaginative vision and state of mind. Therefore, his images would be, for most people, unnatural or non-representational. Even today, for the spectator, Matisse's form may seem right but his colour may seem wrong, because it is not used to convey likeness, but rather sensation. As Matisse put it, "When I put a green, it is not grass. When I put a blue, it is not the sky." At first glance, the viewers of Matisse's work sense the intensity achieved by colour. Using his intuition, Matisse created the effect of a spring sky with complicated colour combinations and luminance. However, in choosing his colour combinations he was, mechanically almost, using the colour wheel popularised by Goethe. Altering the colours of a subject helps to alter the tone of the painting, and bring about a targeted emotional response from the viewer. In many cases, too many colours actually overwhelm viewers, distracting from the subject matter. To avoid this, Matisse used a limited colour palette. In scientific terms, Matisse's paintings work on the brain like a black and white photograph. Although the photograph in tones of black and gray lacks colour, our brains are able to recognise the depicted elements as natural because our minds react to the unnaturalistic colours using one visual pathway. Even if we perceive the colour as wrong, to other visual pathways that are solely monochromatic, the scene seems more right. Discussing colour in terms of right and wrong helps us to understand Matisse's work. Even so, it is important to remember that Matisse never discusses his work in these terms. For him, it does not matter whether colour is right, because the choice of colour reflects his subjective inner vision. Therefore, colour is always right to Matisse, since it responds to his artistic perception. 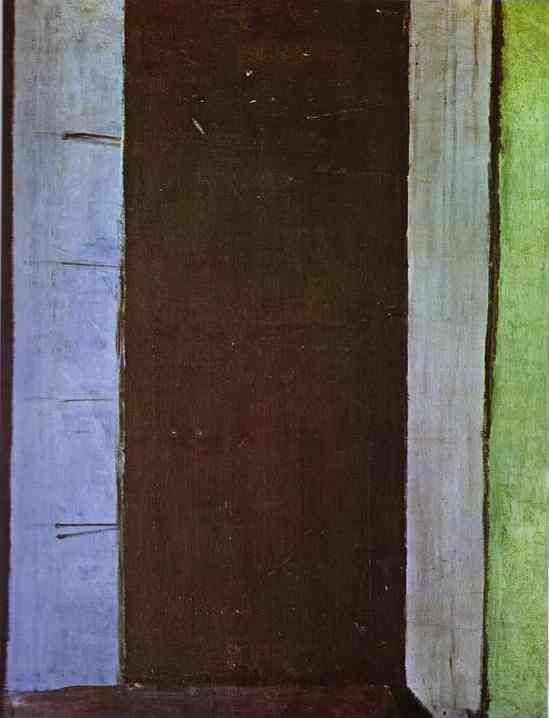 The paintings done by Matisse, particularly 'French Window at Collioure' done in 1914, was picked out in the 1950s by North American artists, notably by Mark Rothko, as a starting point for the New York school of ‘abstract expressionism’. 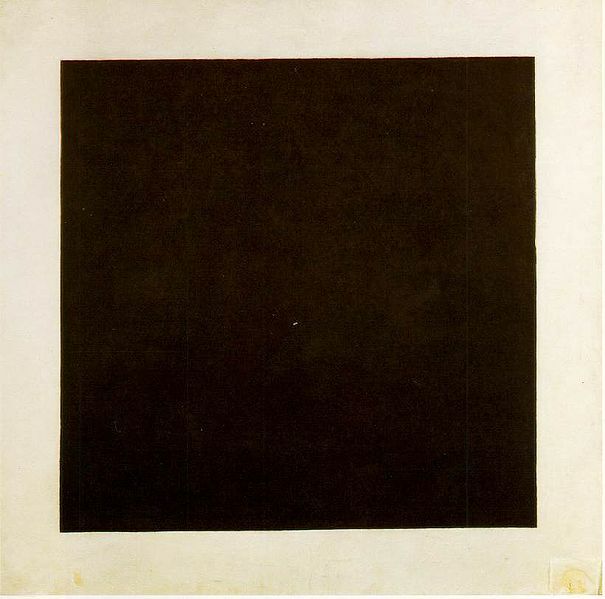 The Russian, Malevich, in his painting made in 1913 entitled ‘Black square on white field’, carried colour abstraction to its ultimate geometric simplification. Critics called his creation a "dead square" and a "void", as well as "the greatest by far among the fairground tricks of instant culture." To Malevich, however, this simple square symbolized a "full void," in that it showed how painting could fulfil itself unaided by any reference to a specific external reality. For him the square represented what he called Suprematism: "the supremacy of pure feeling" in and of itself. Malevich removed specific subject matter by shifting away from representation and mimesis towards the purity of mathematical geometry. "The square = feeling, the white field = the void beyond this feeling." It reads two ways, either a black square on top of a white ground or a black hole surrounded by a white border. Every object has a static facade and an inner dynamic, he believed. This hard-edge geometric abstraction is the forerunner of the later 1960s movement, Minimalism. The way in which Malevich does away with any representation of the material, physical world in this visionary, non-objective art parallels the way in which the Russian revolution will do away with the hated old order. Envisioning a new reality on a higher plane represented Malevich’s life as a devout Christian mystic. For him, spirit and feeling rule over matter. The painting was a statement of Suprematism: "To the Suprematist, the visual phenomena of the objective world are, in themselves, meaningless; the significant thing is feeling, as such, quite apart from the environment in which it is called forth." Malevich's black hole set a new threshold for painting. Malevich knew about the European avant-garde through two sources: Shchukin's collection of Matisse and Picasso, which he assemble in Russia, and through Marinetti, the author of the Italian Futurist manifesto, who made two trips to Russia, in 1909-10 and 1914. From that point on, until Stalin established an official style of Soviet Realism in 1932, Russia was the most progressive country in the world in terms of modern abstract art. 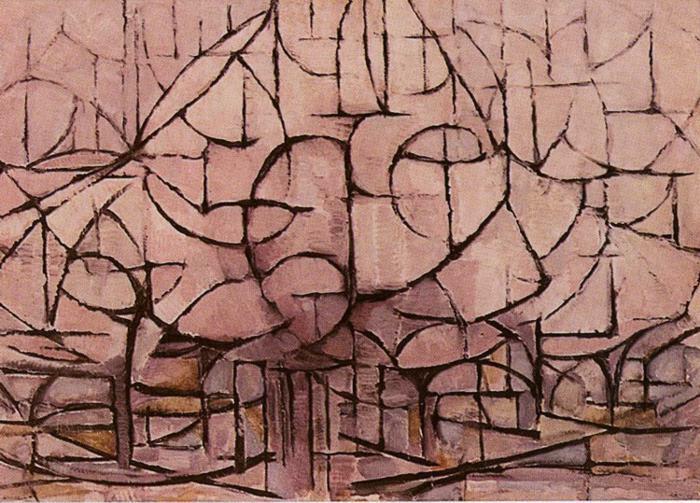 Another founder of abstract art around this seminal time, Piet Mondrian, was an avid reader of theosophy, who once said he learned everything he knew from the founder of modern theosophy, Madame Blavatsky. He joined the Dutch Theosophical Society in 1909, when his work began its gradual evolution from representation toward the abstract. The shift was heralded in his landscapes: wide expanses of beach and sea; forest scenes that highlight the vertical thrust of trees from a horizontal expanse of earth. Mondrian's preoccupation with the tension between vertical and horizontal was later depicted in the haunting abstract cruciform patterns of primary colours that would become his trademark. According to Mondrian's own notebooks, the patterns represent the struggle toward unity of cosmic dualities and the religious symmetry undergirding the material universe. A strong believer in the theosophical doctrine of human evolution from a lower, materialistic stage toward spirituality and higher insight, Mondrian wrote that the hallmark of the New Age would be the "new man" who "can live only in the atmosphere of the universal." For him, all art would converge on geometrical arrangements of primary colours. "...suddenly, for the first time, I saw a picture ... And, albeit unconsciously, objects were discredited as an essential element within the picture." 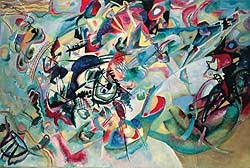 Kandinsky considered Goethe's theory "one of the most important works". It led him to consider art as a spiritual expression, in line and colour, of pure imagination and feeling. Like music which is also an abstract creation, a painting need not have a basis in the material world. 'When I left Moscow in December 1921 several of my paintings, some of them very large ones, remained in the custody of the Museum for West-European Art. Among those paintings is my very first abstract painting from the year 1911 (this was the first abstract picture that was ever painted in our time). Unfortunately, I do not even have a photograph of it. At that time [i.e. 1911 I was dissatisfied with the picture and, therefore, did not number it, did not inscribe it on the back as I otherwise always used to do, and did not even note it in my handlist. But when I saw it again after years I was very pleased with it. 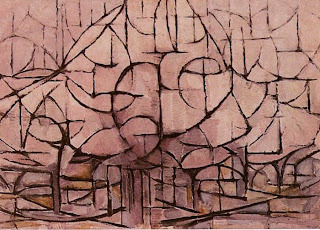 It is a very large painting, almost square, with very agitated form, and a large circle-like form at the upper-right. A century later, we are now firmly in a world inhabited by artists who are no longer dominated by perspective and where colouring is used to reassert the picture plane with flat forms which destroy illusion and reveal their spiritual truths. This allows the abstract artist to use synonyms for describing the mystical space his or her picture has revealed. These synonyms are, paradoxically, more concrete in subjective attributes such as 'depth of feeling', 'penetration into knowledge', 'revelation' or the 'unfolding of veils, which have obscured what is behind them. The depth of their creations penetrates deeper into the mind than the illusion of perspective can ever produce. 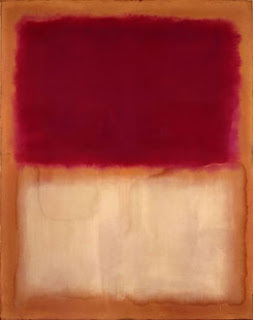 The following powerful statement of what the shift from perspective to colour meant to artistic creativity was made by Adolf Gottleib and Mark Rothko in 1943. 1. To us art is an adventure into an unknown world, which can be explored only by those willing to take the risks. 3. It is our function as artists to make the spectator see the world our way-not his way. Consequently if our work embodies these beliefs, it must insult anyone who is spiritually attuned to interior decoration; pictures for the home; pictures for over the mantel; pictures of the American scene; social pictures; purity in art: prize-winning potboilers; the National Academy; The Whitney Academy, the Corn Belt Academy; buckeyes; trite tripe; etc". This statement is still valid to describe the artistic breakthrough that began at the beginning of the 20th century, when a few artists realised the limits of representational art to raise picture making to the same level of emotion and intensity as music and poetry. To achieve this, painters still apply colour to canvas with the objective of communicating to someone else how the world is. The difference with the Renaissance tradition is that the message is coded through the medium of abstract coloured forms in a flat picture plan. In making these forms the artist is expressing basic human emotions such as tragedy, ecstasy and doom. After receiving the message, the viewer’s world has changed because of his/her idiosyncratic emotional response, which is a neurophysiological phenomenon, sometimes expressed in tears, which we hardly understand.